Fishville's Notes: With total of 58 undergraduates at Yale currently, China represented the second "largest" international student body at Yale campus, only behind Canada's 72. Canada is so close to the United States that in many social events or sports associations like baseball major league, Canada functions as part of the larger America's union. Yale is also one of the very few universities in the United States that grants need-based for financial aids for all of the international students. In other words, Yale will cover all of the demonstrated needs if you were fortunately accepted through need-blind process. Even Stanford is not a need-based university with regards to their international applicants. This is the time for us to correct a perception in Chinese media covering Chinese student being accepted by Harvard and Yale, they always would like to say that the student has awarded a scholarship worth over $50K per year from Yale, this is indeed a misled statement if they did some of the research on the nature of financial aid within some of the most generous Ivy members. Our suggestion to the Chinese newspapers is that you are free to report the great achievements of the students who have been accepted by Harvard or Yale, but for scholarship money the only thing you have to do is to show our gratitudes to the generosity of America's elite universities. International students considering Yale face a unique range obstacles in applying, but University admissions representatives said they are having increasing success in portraying it as a tangible option. Admissions officer said they travel to every corner of the globe to encourage top students to think of Yale as a possibility, and to tell them about the social, intellectual and creative opportunities available. Though American universities cost much more than those in many other countries — not including financial aid — and the liberal arts model is unfamiliar to international students who have grown up in professionally-oriented systems, admissions officers said their efforts are beginning to pay off. Rebekah Westphal, co-director of international admissions, said international students get excited about applying to Yale when admissions officers spread the message that Yale is about much more than an education in the classroom. Lee said international students often do not want to apply to Yale, or any college in the United States, because in their home countries, students have to begin career training at the undergraduate level in order to become a professional. Because the idea of a liberal arts education is unfamiliar, diverging from traditional paths can seem daunting to these students, she added. Indeed, six international students interviewed said the idea of a liberal arts education seemed strange to them when they first encountered the concept. But three did say that once they learned more about the liberal arts model, it became an attractive feature of education in the United States. “I decided to come mostly because I didn’t know what I wanted to study,” said Carolina Cooper ’11, who attended an American high school in Brazil. She added that she did not feel ready to choose a specific professional degree to pursue during her first year of college, which she would have been expected to do if she had stayed in Brazil. International applicants can also be deterred from choosing to apply to college in America because universities in their home countries are highly subsidized or free, admissions officers and international students said. Westphal said she and other admissions officers try to counter these concerns by emphasizing that Yale is an investment that frequently pays off in career opportunities down the road. They also spread the word of the University’s financial aid offerings — Yale is “one of only a small handful of U.S. institutions” with need-blind financial aid for international students, Westphal said in an email. Sunnie Tölle ’12, who attended a public high school in Switzerland, said there is little incentive for Swiss students to study abroad, because Switzerland offers free upper-level education. “People see the $200,000 for four years of schooling, and there’s no way they’re going to choose that,” she said. But Eva Guadamillas ’14, who is from Spain, said that after she researched Yale’s financial aid policy she realized that it could be an option for her after all. Cooper added that the University’s need-blind approach for international students gives it a particular edge over some of its peer institutions, which do not share that policy. When choosing students from its international pool, Yale also does its best to bear in mind the circumstances those applicants grew up in, Lee and Westphal said. For example, they said, international students simply may not have the time to participate in extracurricular activities the way domestic applicants do. “If students are required to be in school ten hours a day, there just isn’t time to be debating or playing on a sports team,” Westphal said. Lee added that admissions officers travel not only to share information with prospective applicants, but also to learn about the worlds in which those applicants live. Still, some barriers cannot be overcome. Lee and Westphal said they conduct their information sessions in English because students who plan to apply and come to Yale must speak it fluently. Senem Cilingiroglu ’13, who went to an international school in Turkey, said that in her experience, students who attended private, international schools are far more likely to meet the necessary standard than those who went to domestic schools. 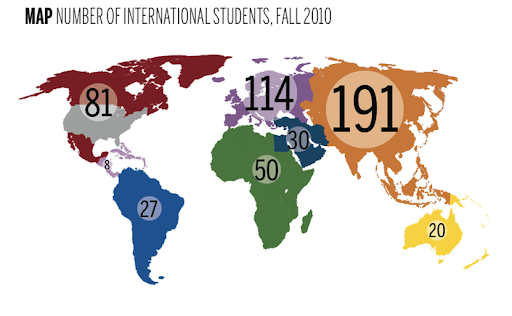 Last year, 17 percent of 25,869 applicants to Yale College were international students.